The Raiders flew out of Boston on Sunday night with a positive mood about the camp. The 0&3 team came within a score of beating the mighty Patriots in their own backyard. If their confidence needed an extra boost then they will find it in their sleep, or lack of it. Jet lag seems to have been a real issue with the Silver & Black at the start of their UK visit. 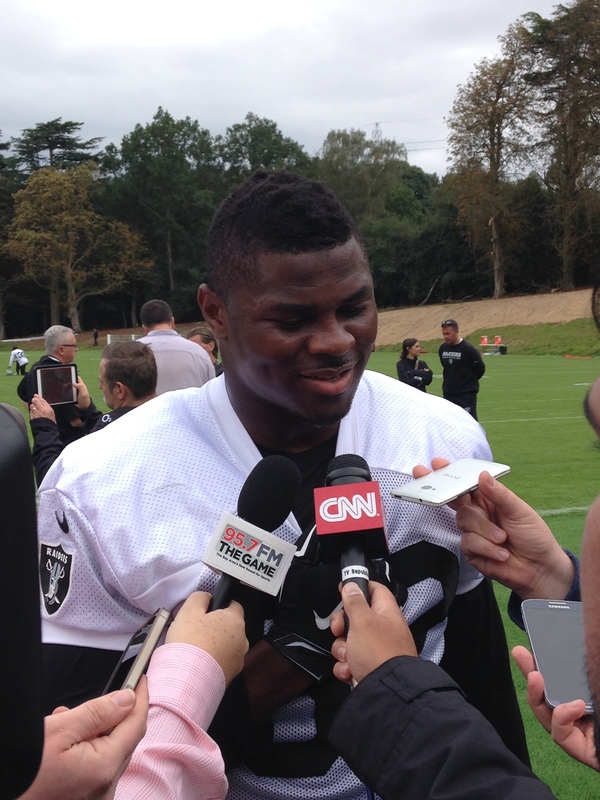 When asked about it, their first round draft pick, Khalil Mack quickly snapped, “Monday, oh my God! It was a tough day. To stay up throughout the whole day and then you go to be at 8pm and you can’t sleep.” So how bad was it? “It’s ok now, I’m starting to adjust…we’re all adjusting now”. It’s taken them three days to sync their body clocks to GMT. Miami don’t fly out until Friday. Friday is normally a rest day for the Dolphins, but will they be ready in time? Saturday’s social commitments will surely take its toll on them. Compound that with the off field shenanigans this week and it doesn’t look promising for Joe Philbin and his team. Veteran Defensive End, Antonio Smith, is still adjusting to the five hour leap forward in time (from New England), “I’m still suffering. I have not defeated the demon of jet lag yet.” When asked if that would play to Oakland’s advantage, the former Cardinals and Texans man said, “I hope it does because if they’re going to feel like I’ve been feeling with hardly any sleep it’s going to be a hard one for them to play”. The former Super Bowl MVP, Terrell Davis, has been impressed with the preparation the Raiders have put into this week’s game. “They’ve given themselves plenty of time to acclimatise. They’ve done the right things (by coming over early) and I think they stand a good chance of winning”. The former Broncos RB did acknowledge that Miami have been here before and, therefore, know what to expect. But he thinks they’ll find it hard to adjust in time. What we want is a great game. The Black Hole seem ready for it.